How does each product work? Our LEATHER OIL is an exquisite conditioning oil for maintaining suppleness of leather while preserving the skin and providing water-resistance. 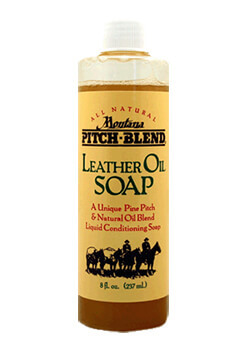 We blend together rich pure mink oil with amber pine pitch sap to create a golden amber oil ideal for leather care. 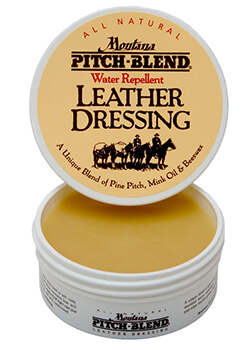 Our LEATHER DRESSING is an especially protective conditioning balm with the very highest water-repellency for the most demanding climates. Made from our Leather Oil conditioner / preservative and blended together with just the right amount of natural Beeswax to create a soft wax balm. We use our exquisite Leather Oil and blend it together with a rich vegetal oil base giving multiple sources of oil and fat to the soap essential to the leather. Any questions we still haven't answered for you yet? Each product has application instructions right on the package, but here are brief application instructions. Start with a clean, dry leather surface at room temperature for proper absorption. 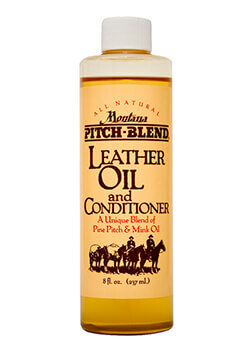 Add a small amount of Leather Oil or Dressing into the palm of your hand then massage directly into leather. If needed, finish by buffing briskly with a clean, dry, lint-free cloth to help even out your application, pickup any excess product, and develop a rich glow to the leather. Drizzle a small amount of Leather Oil Soap onto the wet applicator. Swirl applicator with Soap directly onto the leather to suds up as you work gently into skin. Rinse applicator, squeeze or shake off excess water, and go back to leather to rinse and dilute remaining soapy water. With a clean, lint-free cloth, wipe leather and wick up any excess liquid. Let dry, then finish with application of Leather Oil or Leather Dressing (above) to recondition, provide water-repellency, and protect the skin.